Supra United's Grassroots Soccer Academy is for every child who is interested in having fun playing soccer. It is designed for all experience levels in soccer. The coaches involved in Supra United's Grassroots Soccer Academy strongly believe in the principles of sandlot soccer or street soccer in conjunction with guided discovery of the game (asking the right questions to allow the players to discover the game for themselves and not be explicitly instructed.) This is the educator’s choice in child development and the professional, Ontario Soccer Association licensed coaches of Supra United's Grassroots Soccer Academy are focused on building an effective and nurturing community for young children to grow. At Supra United's Grassroots Soccer Academy, you know what you are getting! * Professional, Provincial Licensed Coaches and educators in the field of Child development working together with parents. * Age appropriate soccer games and activities designed for proper development of cognitive and competitive skills. * Suggestions and involvement on ways you can help your child enjoy and stay active in sports. * Players learn skills the right way from professional, provincial licensed coaches. * Every player keeps their own Supra United Grassroots Academy T-Shirt. * Every player keeps their own Supra United Grassroots Academy Skill Ball. * Your child will be in a supportive, patient environment. Children are encouraged to be the author of their lives, not a puppet held up by strings. This is their time to be kids, have fun, play soccer, and patiently develop the skills necessary to be self assured, confident youth, who take ownership and enjoy what the game means to them. Supra United's Grassroots Soccer Academy emphasizes skill development and small-sided games. “Skills” is the application of technique (dribbling, passing, receiving, etc) under pressure from an opponent. 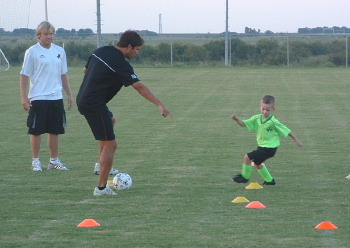 Skills is the critical component to your player having fun in soccer as they grow. Directed by our provincial licensed, professional coaching staff, this academy is a perfect way to keep soccer fun and ensure quality development of skills as your child grows in soccer.